The Schwinn AD6 Airdyne Upright Exercise Bike has everything that you’ll need for a good workout. The air resistance provides you more intensity than most upright bikes. The faster you pedal the more resistance you will receive. Schwinn also provides pivoting handlebars for a great upper body workout. You’ll also be comfortable in the large padded seat and the foot straps will ensure better balance and support while pedaling. The Schwinn Airdyne Upright Stationary Exercise Bike also has the capability to track your heart rate by way of chest strap. Though one is not provided, this a great feature for ensuring you are getting the workout that you are looking for. Schwinn also provides some add-on accessories for the AD6 Airdyne Upright Exercise bike, like a reading rack and wind screen. This is a great bike with some nice features and everything you’ll need to get in to shape. Click here to see the price of the Schwinn AD6 Airdyne Upright Exercise Bike on Amazon. Quiet, frictionless, high-strength ABS plastic fan provides infinite wind resistance. The harder you pedal the harder the resistance. BioSynch linkage system with shrouding for safer workouts. Telemetric heart rate capability works with Polar compatible 4.5kHz-5.5kHz chest strap transmitter. Workout upper and lower body simultaneously or independently. Extra padded, anatomically designed seat. Foot straps on self-balancing pedals for greater motion control. Shipping costs will vary for the Schwinn AD6 Airdyne Upright Exercise Bike depending on where you purchase from and what type of delivery you prefer. However, some retailers, such as Amazon.com, will provide free shipping. The assembly process is straight forward and simple with the instruction manual. Schwinn also provides all the tools that you will need to put this bike together. Some of the main parts can be a little heavy, but a single person can manage the assembly. In all, it should take the typical person about an hour to assemble. The best feature on the Schwinn AD6 Airdyne Upright Exercise Bike is the heart rate monitoring capability. This is a great feature because it allows you to train in your target heart zone. You can monitor your pulse readouts on the computer display to ensure that you’re in the right fat burning or cardio zone. While Schwinn does not include a chest strap monitor, the AD6 Airdyne Upright Exercise Bike works with Polar compatible 4.5kHz-5.5kHz chest straps. Schwinn is a good name in exercise equipment and often people feel comfortable buying the product because they know that they’re getting quality. There have been a good number of buyers however, that have had quality issues with the AD6 Airdyne Upright Exercise Bike. Some quality issues effected assembly, where parts were broken or misaligned. Others have claimed clicking noises and internal parts breaking after only a couple of weeks. While these are troublesome issues, we will say that not all buyers have these issues; it may be a quality control problem. Additionally, the Schwinn AD6 Airdyne Upright Exercise Bike has a pretty good warranty at 15 years for the frame and 3 years for the parts. 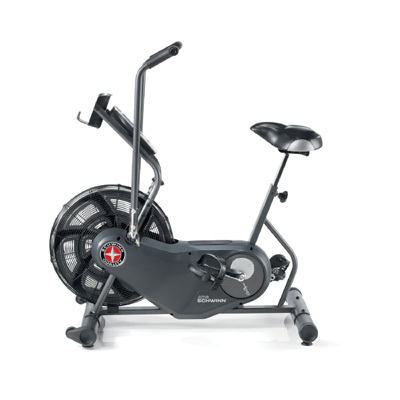 You can find the Schwinn AD6 Airdyne Upright Exercise Bike for under $600 online. At this price, you’re getting a good stationary bike with everything you’ll need for a great workout. The air resistance provides an intense workout for any fitness level. Additionally, with the purchase of a chest strap heart rate monitor you can track your performance on this bike. The most worrisome issue is that some users have received bikes with quality issues. Schwinn does provide decent warranties on the AD6 Airdyne Upright Exercise Bike, but it is still a pain to have to deal with potential quality problems.